The primary methods of moving around in medieval times were on foot or horseback. Many people in this time period were born, lived, and died within a relatively small radius. The average person can walk 3 miles per hour, that is a mile every 20 minutes. In many parts of the world, walking is still a primary means of transportation. Some will walk 10 miles to get to a local village, spend the day working at a job there, then walk the 10 miles back home again. Even back in medieval days, pilgrims would routinely travel 10 to 20 miles in a given day. If there was a pressing need, they could go even further, if there was a well maintained road to travel on. Horses walk between 3-5 miles an hour. Horses could travel 40 miles in a day without much trouble. If there was a problem, the horse could go 60 miles before it needed a break. Horses can trot at about 8 miles an hour, as fast as a person runs. They canter at 15 miles an hour. They gallop at about 30 miles an hour. The gallop was never meant for long distances, this is a burst of speed to get to safety. A horse can only gallop for 2-3 miles before they need to slow down. Note that in modern times, the best of the best horses are raced in "endurance rides" where they are sent on 100 miles which they cover in 10-12 hours. Note that these aren't average horses though, they are the elite. Wagons and covered coaches were used extensively by the Romans who then emphasized their use in Britain. By medieval times, both open wagons and covered coaches were heavily used for transporting goods and people. Wagons could be two-wheeled for smaller loads or four-wheeled for larger tasks. Note that these vehicles did not have the modern luxury of well-crafted springs, so the voyage could be a bit rough. The overall speed and comfort of travel of course depended a lot on how well made the base wagon was and on the condition of the roads. A good average daily distance would be 20 miles. For oxen, which are slower, the distance is more in the range of 10 miles. Some of these vehicles would be open-top, sort of like the traditional farm-wagon we often think of. Some would have an arched set of branches or wood covered with fabric, like the Old West Covered Wagons. And some would have a wooden structure built on top of the base to provide a sturdier protection, complete with doors. There were even horse "litters" - where the container holding the people would be suspended between two horses and there were no wheels at all. This would do better for going over bumpy terrain where wheels could get stuck. 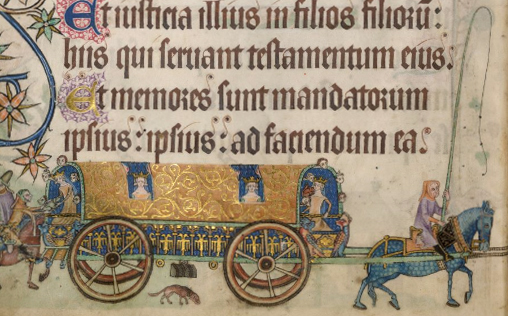 This image below comes from the The Luttrell Psalter done around 1325 but the covered coach was well known all through Medieval times. To compare all of these methods of transportation for speed, the Pony Express system - which involved relaying fresh horses at each stage, as well as fresh riders, could manage to pass a note over 200 miles in a single day.